August is dominated by the Flanders Campaign. The Battle of Pilckem Ridge ended on 2 August, resulting in some gains and 32,000 British, 1300 French and 30,000 German casualties. Proponents of the offensive argued that these were small losses compared to 1 July 1916, the first day of the Somme offensive, hardly a convincing argument. 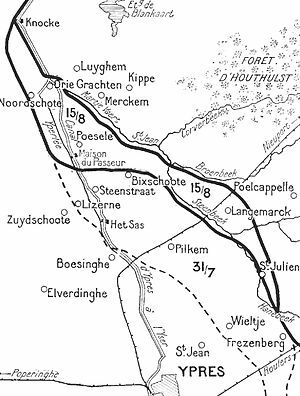 On 15 August the Battle of Hill 70 (overlooking the town of Lens 30 miles south of Ypres) began, the intention being to make life easier for their comrades at Ypres by drawing German troops away from the main thrust of the offensive. 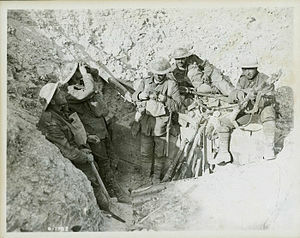 The Canadians took the hill in ten days but suffered heavy casualties (9000); the Germans suffered grandly (more than 20,000) but were able to hold without help from the north. Incidentally, just about two years earlier at the battle of Loos the British suffered 60,000 casualties attempting to capture the same territory. Meanwhile, back at Ypres the drive restarted on 16 August with the Battle of Langemarck. The offensive ended two days later with the capture of Langemarck but a failure to seize all the higher ground and certainly no breakthrough. 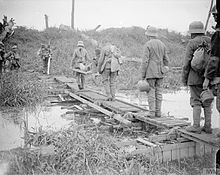 A major part of the problem was the unseasonable rains, which given the destruction of the drainage canals, turned the battlefields into quagmires and slowed any advance, especially considering that the allies were on the lower ground. The offensive was halted until conditions were better. 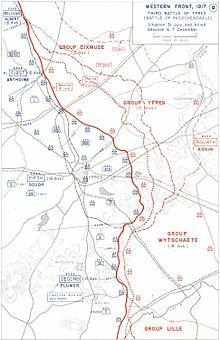 The battle, including subsequent small actions, cost the Allies some 36,000 casualties and the Germans 26,000. It just went on and on. And speaking of going on and on, on 20 August the French launched an offensive on both sides of the Meuse at Verdun. The objectives were limited and mostly attained, but the tactical/strategic situation was unchanged. The French captured 11,000 prisoners, but suffered 14,000 casualties; the new German POWs were the lucky ones. 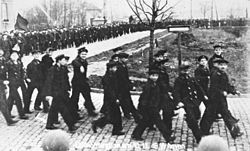 An ominous sign, on 2 August 350 crew of one of the German dreadnaughts at Wilhelmshaven engaged in a protest, only to be severely disciplined – two leaders were shot. This put an end to such demonstrations for the duration of the war, but also led to the spread of clandestine sailors’ committees on the big ships. The sailors would be heard from again. On 6 August Kerensky became Prime Minister of Russia, but his days were numbered. Liberia declared war on Germany on 4 August, presumably following the American lead, and the new Republic of China on the 14th, presumably to curry western favor. And on 17 August – drum roll! – the Eleventh Battle of the Isonzo kicked off. 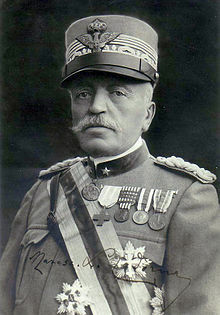 The offensive would fail, hardly a surprise, and prepare the way for the major Italian disaster of the Twelfth Battle. This entry was posted in Belgium, Canadians, Germany, Great Britain, Great War, Hill 70, history, Isonzo River, Langemarck, Luigi Cadorna, Passchendaele, Pilckem Ridge, Verdun, war, Western Wall, Wilhelmshaven, World War I, Ypres.